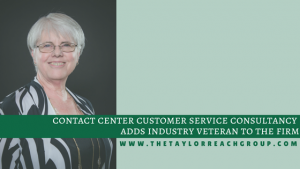 Contact Center Customer Service Consultancy Adds Industry Veteran to the Firm | The Taylor Reach Group Inc. The Taylor Reach Group’s (TRG) CEO and Chief Chaos Officer, Mr. Colin Taylor, announced today the addition of Peg Ayers to the Contact Center, Call Center and Customer Experience consulting firm. Peg’s past experience includes leading centers for Office Depot, Office Max, Grand & Toy, Cendant, Affinion Group and Aegis Communications. In addition to earning her Customer Experience Professional Certificate (CCXP), Ayers is also a certified John Maxwell Team speaker and teacher. “Our team is ecstatic to have Peg on board. She has a gift for developing leaders with great skills and abilities. Coupled with high integrity and a track record of beating the competition through effortless service, Peg is a top-notch leader” Taylor said. The Taylor Reach Group, Inc. – A global Contact Center, Call Center, and Customer Experience consulting firm, established in 2003, is devoted to helping clients solve Customer Experience, Contact Center, and Customer Service challenges. Taylor Reach serves client organizations with 5 to 10,000+ agents. Working across many verticals, from SMB’s to Fortune 500 and Global 1000 firms, Taylor Reach consults Contact Centers of all shapes and sizes. For more information on The Taylor Reach Group, Inc. visit https://thetaylorreachgroup.com or phone Sarah Hill-Stapley at 1-866-334-3730 ext. 112.